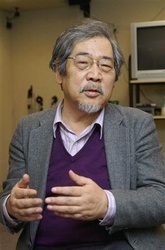 Noboru Ishiguro (August 24, 1938 - March 20, 2012) was a Japanese animator who was noteworthy for directing the anime series The Super Dimension Fortress Macross, The Super Dimension Century Orguss, Yōkai Ningen Bem, Megazone 23, Legend of the Galactic Heroes, Noozles, and the 2008 completed series Tytania. He was in a Hawaiian style music band in his youth. Therefore, he was known as an animation director who could actually read musical scores and had made the best use of his previous experience for works such as "The Super Dimension Fortress Macross: Do You Remember Love?" and Legend of the Galactic Heroes. Ishiguro Noboru passed away on March 20, 2012 in Kawasaki City Hospital. He died of a lung infection which was the result of a followup surgery procedure to the aneurysm surgery he underwent two years prior.